The Ultimate Fighting Championship held “UFC Fight Night 139” at the Pepsi Center in Denver, Colorado, United States on November 10, 2018. The fight card featured 12 mixed martial arts matches, three of which were female matches. In the first bout of the evening, two American fighters faced each other in the bantamweight division. Mark “Bumblebee” de la Rosa, 24, of Fort Worth, Texas battled it out with Joby Sanchez of Albuquerque, New Mexico. Born in Lubbock, Texas on August 31, 1994, de la Rosa is training out of Genesis BJJ in River Oaks, Texas. “UFC Fight Night 139” marked his third bout in the UFC. Born and raised in Albuquerque, Sanchez is training out of Jackson Wink MMA. “UFC Fight Night 139” marked his second bout in the UFC. After three five-minute rounds, the bantamweight bout between de la Rosa and Sanchez was left in the hands of the judges, who scored it 29-28, 28-29, 30-27. In the end, referee Tim Mills raised the hand of the Texan contender, who was declared the winner via split decision. 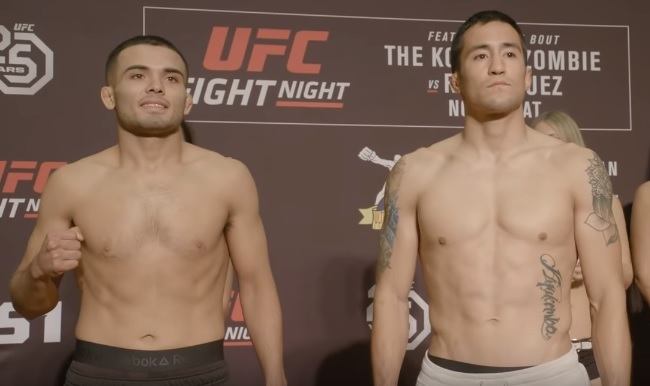 Winning at “UFC Fight Night 139” improved de la Rosa’s professional MMA record to 11 wins and 1 loss. It was his second win in the UFC. On the other hand, Sanchez now has 11 wins and 4 losses. He has 0 win and 2 losses in the UFC. In the co-main event of the evening, Donald “Cowboy” Cerrone, 35, of Albuquerque, New Mexico, United States and Mike “Platinum” Perry, 27, of Orlando, Florida, United States battled it out in the welterweight division. The fighter from Albuquerque submitted his opponent from Orlando via armbar at 4:46 of Round 1. In the main event, “The Korean Zombie” Chan Sung Jung, 31, of Seoul, South Korea and Yair “El Pantera” Rodriguez, 26, of Chicago, Illinois, United States competed in the featherweight division. The American contender knocked out his Korean opponent via elbow at 4:59 of Round 5.